During the walk along the stations of the cross it is tradition to read texts that bring the stations to life for the believers by relating them to recognizable suffering in their own lives and in the world around them. The exhibition Art Stations of the Cross, that is taking place in Amsterdam from 6 March – 22 April, does the same with the help of artworks. 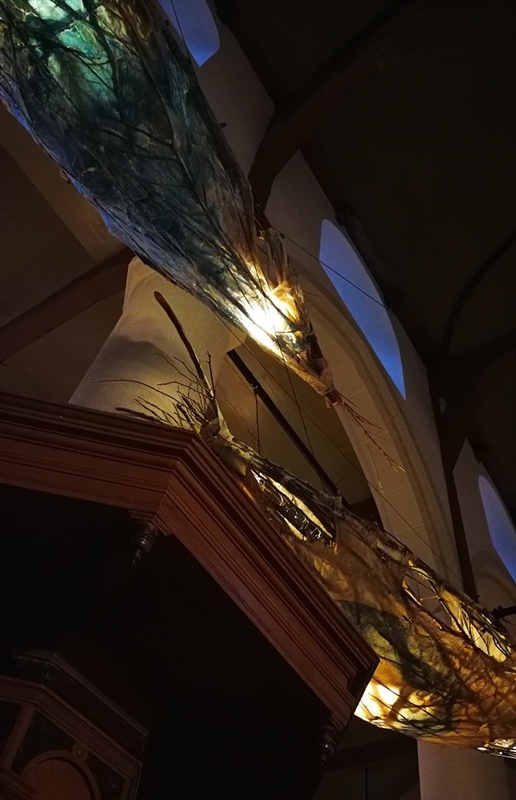 As curators we chose ‘Troubled Waters’ as the theme of the Amsterdam edition of Art Stations of the Cross, as Amsterdam came into existence and grew as a city of seamen, trade and fishing. Water also plays an important part in today’s global problems – think of seas as barriers for refugees, exploitive trade and fishing, the plastic soup in the oceans, tsunamis and the loss of coral reefs. Linked to Station 11, Jesus is Nailed to the Cross, is the installation Salt Water Skin Boats by Canadian artist Erica Grimm in collaboration with Tracie Stewart (artist and arborist) and Sheinagh Anderson (sound artist). This work raises the issue of the earth-threatening ocean change. The installation consists of five so-called lifeboats made of branches of willow, dogwood, fig and cedar, cheesecloth, animal skin, gut and layers of wax. Poems, bathymetric ocean maps and scientific formulae about the melting of the ice sheet, the rising sea level and the acidification of the water have been applied to the hulls. The vulnerable skin boats show the interconnectedness of the life and decline of the oceans and our own salt water filled bodies: they are boats but also human bodies whose life is dependent on the condition of the worldwide water. The ambient soundscape embodies the sounds of water, wind, the breathing and the heartbeat of the oceanic world, intermittently interrupted by the voices of technology and science– sonar, submarine, ship and plane. 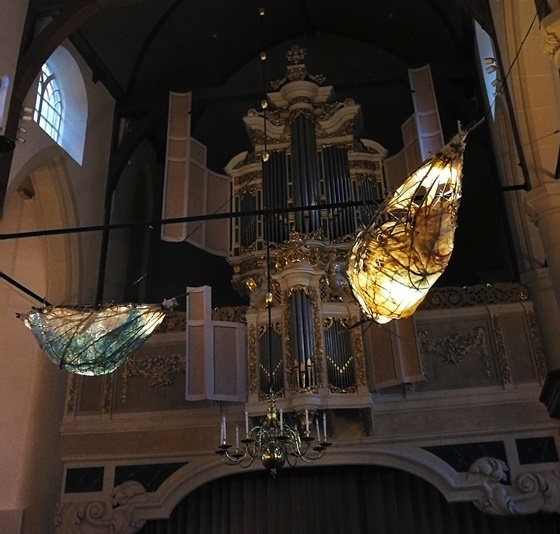 The light that falls through the windows of the Waalse Kerk and the lamps that illuminate the boats from within reveal the beauty of the coracles. The oceans are so incredibly beautiful, so full of life, but in the last two hundred years human actions have changed the chemistry of the ocean – which deeply affects our own existence as well. We crucified God’s son. Is it now creation’s turn? Have we heard it all before? “Why is it that we do not undertake more action, also the people who do not bury their heads in the sand?”, Erica asked me. Not an easy question. Is the overflow of information to blame or the overfullness of our lives: today this problem, tomorrow another? Or does it become too difficult when it is really going to cost us? I replied that it is hard to be really touched by problems at such a global magnitude, to feel them deeply within, deeper than our heads alone. That we need to quieten down for that to happen. I said that art asks for meditative quietness and therefore can help us let the suffering of creation land in the depth of our hearts. 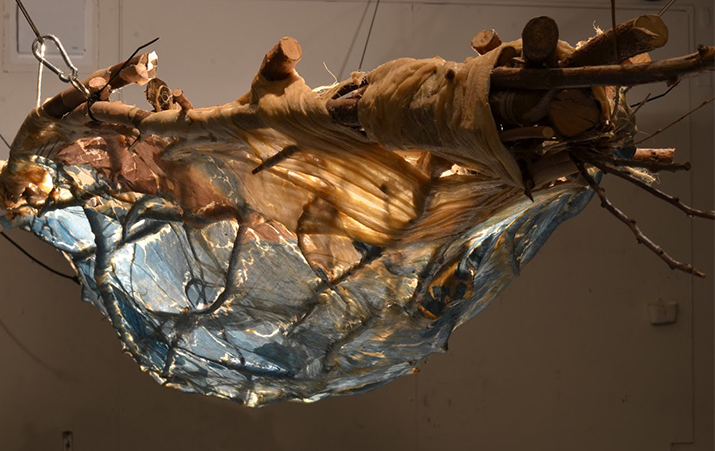 Erica Grimm in collaboration with Tracie Stewart (artist/arborist) and Sheinagh Anderson (soundscape specialist), Salt Water Skin Boats, 2018, willow, dogwood, fig, and cedar branches, cheesecloth, animal skin and gut, bathymetric ocean maps, layers of wax, earbuds, LED lights. Photo 1: SWHuget. Photos 2 and 3: Alma Ouweneel.